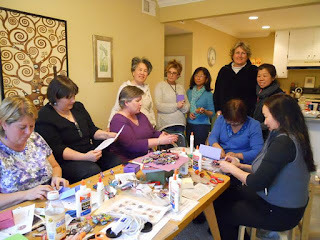 Eleven great ladies met to have a fun day gabbing, sharing, shopping and crafting. Most drove a distance to meet for this annual event. We first met at raft (resource area for teaching) to check out the newly opened facility. We all came out with bags full of great things for our workshops and classes. A few more stops, lunch, then share, show and tell. 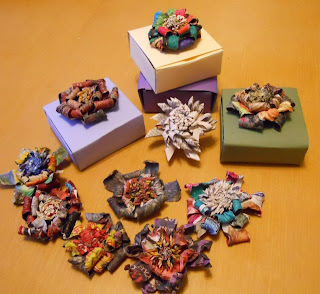 We ended the day sharing the Paper Rose and box craft. As I share this craft, I am learning better ways to pass on the 'how to dos'. This is a great way to improve templates and explanations. I came away with some very valuable suggestions from very smart ladies. We sure had FUN! The results ....Great Job Ladies!